and to listen to the successful experiences from speakers from FAO of the UN, CTA, and HIFA, - three organizations that are active users of Dgroups. Dgroup is a longstanding successful development initiative that promotes dialogue. Supported by over 20 organizations, it currently engages over 290 000people in all countries and territories of the world. It offers an easy to use email tool and an online platform for small or large groups that benefit from networks and discussions. 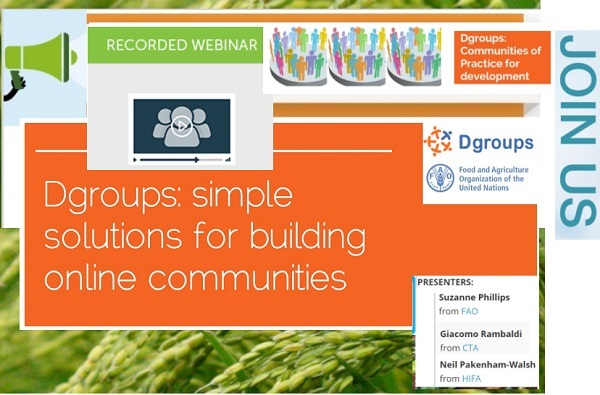 ... shares her experience using a Dgroup to connect a global community of FAO Farmer Field School practitioners all over the world. She is in charge of the coordination of the global Farmer Field School Platform at FAO and uses Dgroup as an additional tool to ensure inclusion of all stakeholders, even when they have a poor internet connection, low IT-literacy and little time to engage in exchanges. ... talks about the Unmanned Aerial Vehicles (UAV) for Agriculture Dgroups - and how it has been instrumental to carry out a mapping of existing and forthcoming policies, laws and regulations governing the use of UAVs. ... presents how Dgroups is being used by the HIFA forums. These groups bring together more than 15,000 people from 175 countries to explore ways to improve the availability and use of health information in low- and middle-income countries. Dgroups is the platform enabling the conversation and dialogue on the HIFA forums.